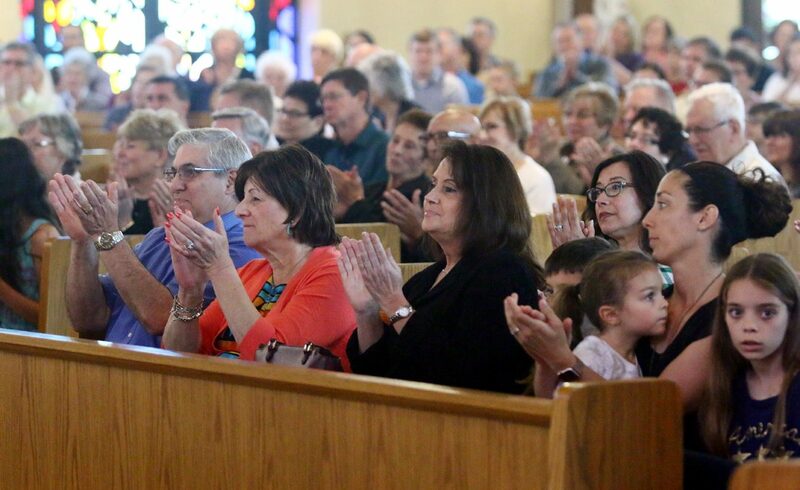 Parishioners of St. Robert in Warrington show their appreciation for the visit of Archbishop Charles J. Chaput as they closed the 50th anniversary celebration of their parish's founding with Mass on Sunday, June 3. St. Robert Bellarmine Parish in Warrington closed out its 50th anniversary observance with a jubilee Mass celebrated by Archbishop Charles J. Chaput on Sunday, June 3. 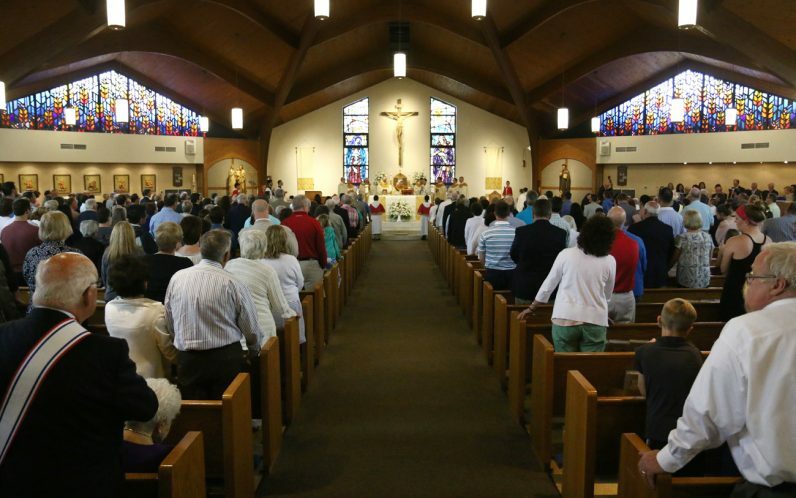 At age 50 the Bucks County parish is still growing. The actual founding date was May 31, 1968 for a congregation of slightly over 300 families formed entirely from neighboring St. Joseph Parish, also in Warrington. The first Masses were celebrated by Father Michael Marley at St. Joseph, but beginning July 7, 1968 Masses were switched to the Barn Cinema Movie Complex in Doylestown. According to parish pioneers, volunteers at the time had an interesting chore – sweeping up the popcorn before the liturgies. Meanwhile Father Marley had purchased the 15-acre plot of land that comprises the campus of today. Ground was broken for a church/hall on July 27, 1969 and it was dedicated Dec. 5, 1970. The present church was built in 1982 during the pastorship of Father James Cassidy. Of the 300 founding families, about 100 of them are still active and the parish on the whole has grown to 2,300 families, according to Msgr. James Beisel, who has led the parish since 2005. Msgr. James Beisel, pastor, distributes holy Communion. In the beginning children from St. Robert attended St. Joseph School, which became a combined school taught by the Sisters, Servants of the Immaculate Heart of Mary and lay faculty. When St. Robert built a school the upper grades attended at St. Robert with the lower grade at St. Joseph, but now all attend at the St. Robert campus, which has the newer building. “It is cost effective to keep them all here and our principal (Deborah Jaster) does an excellent job,” Msgr. Beisel said. Thanks to an effective capital campaign, the parish has recently reconfigured the first church into a parish meeting center which contains a gym and office space; also a new narthex has been added to the present church. “After 50 years we are still expanding,” Msgr. Beisel said. Sheila Fehrman, one of the original parishioners, well remembers the Masses at the theater. Her husband Bill has been an extraordinary minister of holy Communion from the time the role was initiated and their four children all went through the parish school then on to Archbishop Wood High School. 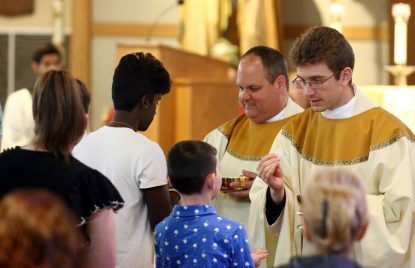 Father Steve Paolino (left), a former parochial vicar at St. Robert Bellarmine, and Father Matthew Biedrzycki, current parochial vicar, distribute holy Communion. Tom Castaldi, who was a lector at the jubilee Mass, arrived with his wife Lois soon after the parish was founded and put their five children through the school. The parish continues to grow by approximately 70 families a year, according to a short parish history, with about 60 infant baptisms annually. At present there are more than 500 children in the Religious Education Program and 270 children in the school. 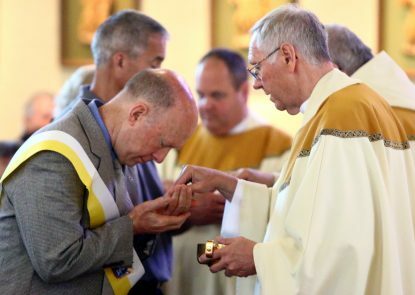 St. Robert Parish observed its 50th anniversary throughout the past year by a host of activities starting with an opening Mass celebrated by Bishop Michael Fitzgerald last Sept. 17. The June 3 closing Mass celebrated by Archbishop Chaput was followed by a dinner that evening at the Spring Hill Country Club. St. Robert Bellarmine Parish, Warrington.